Tangled and True: muffin tin lunch. We tried something new for lunch, it's not a new idea, but we've never done it before, the girls were so excited when I brought it out to them, I was thrilled that they ate lunch with no complaining. For the most part it was healthy and relatively easy to put together! The possibilities are endless and it gives a good variety. All in all it was a great day for lunch. I have to try this with my picky, independent, free-spirited and strong-willed 23 month old - today!! Thanks for the great idea. I adore this blog more than I could ever say! 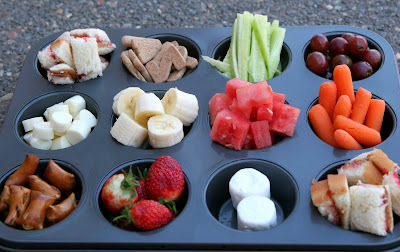 this is a fun idea, I wonder if my kids would actually eat fruit if I presented it this way, the would probably head straight for the pretzels and marshmallows...ahhh! This is SO cute. I love the idea Brittany! great idea!! I've been using one of those cafeteria-style plates but I'm sure this will go over even better!!! AWESOME. This is a great idea, thanks for sharing! great idea, I think my kids would really like this....its fun to offer good food in a fun, and different way. brilliant. had to post it on kirtsy. love it. thanks for the inspiration, again. Everything in that tin looks so enticing. I love how the bright colors just "pop" out of the photo. And this is such a nutritious option too! What a cute idea! My daughter's first birthday is coming up and i am doing a cupcake theme (if that makes sense). This would be a great idea to put out for some finger foods on tables! Thanks! It would be great to have your photo added to our flickr group. Yay! Great minds think alike. I took it to a lunch/play date and the kids loved it. What a fun way to get them to try a little bit of everything. very creative idea! presentation is everything!